The Brazilian Federal Regional Tribunal (TRF-2) today issued a unanimous ruling upholding the return order of Sean Goldman by Friday December 18th. Although it can be expected that the Lins e Silva and Rebiero families will file additional appeals directed at Brazilian Supreme Court Justice Marco Aurelius Mello to stay the return order, David Goldman departed tonight for Brazil, accompanied by United States Congressman Christopher Smith (R-4) of New Jersey. Mark DeAngelis, the head of the Bring Sean Home Foundation, stated this afternoon that we will remain “cautiously optimistic” until David and Sean are on an airplane home and “the wheels are up.” The Lins e Silva and Ribeiros have filed +40 delaying appeals since the initial ruling this past June. Congressman Smith issued the following statement on December 16th, which we heartily endorse. U.S. Secretary of State Hillary Clinton also issued a press statement on the ruling (below). A unanimous ruling by the Brazilian Federal Regional Tribunal court today is expected to pave the way for the prompt return of nine-year-old Sean Goldman back home to his New Jersey father, David Goldman, Congressman Chris Smith said today. The Court ordered that Sean must be turned over to his father on Friday at the U.S. consulate in Rio de Janeiro. Closing in on six years since Sean was unlawfully abducted from his Monmouth County, N.J. home where he resided, the ruling recognizes he belongs with his biological father in New Jersey. Sean’s mother, who had abducted him to live in Brazil in 2004 without David Goldman’s consent, later died, leaving Sean with her second husband. Smith urged the family of the second husband, Paulo Lins e Silva, an influential Rio de Janeiro lawyer, not to engage in another legal delaying tactic to prolong the reunion between father and son. “Further frivolous and delaying motions and appeals by the de Silva family must stop,” Smith said. “It is long past time for Sean to come home. Sean was 4 when he was abducted, and now he is 9. For five years, the wheels of justice in Brazil have been torturously slow. David Goldman has been robbed of a large part of his son’s childhood. But David is a father who had never given up in his fight to bring his son home. He will not surrender his right to raise his child—rights of which he was wrongly deprived in the 2004 abduction. The U.S. Congress is strongly behind him,” Smith said, referencing H. Res. 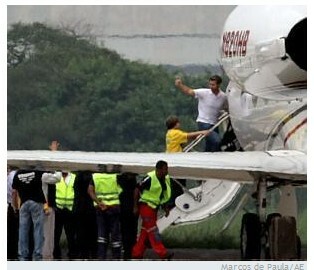 125 in which the House of Representatives called on Brazil to fulfill its international obligations and send Sean home. Smith said under the Hague Convention on International Child Abduction Brazil signed, children like Sean who are wrongfully removed from one nation to another must be returned to their country of habitual residence within six weeks. Smith noted that three court-appointed Brazilian psychologists determined earlier this year that Sean is being psychologically harmed by the abductors. Reports on “Compliance with the Hague Convention on the Civil Aspects of International Child Abduction” stated that Brazil demonstrated a “pattern of non-compliance” due to judicial performance in 2007 and 2008. Sean Goldman was born in New Jersey and was abducted at four years old when his mother, a Brazilian native, left the U.S. on a supposed vacation to Brazil. Immediately upon arriving in Brazil she declared to her husband, David Goldman, her intention—without a lawful custodial agreement—not to return to the United States with their child. She later remarried, and died during childbirth in 2008. Sean has been held by her second husband, a prominent lawyer from a powerful family who is waging a court battle to block Sean from returning to his father. Under the provisions of The Hague Convention, children who are wrongfully taken by one parent must be immediately restored to their previous living arrangement. If custody has not yet been determined, the proper court in the country of habitual residence will determine custody. The Sean Goldman case was bogged down in Brazilian courts for four years before David was even permitted to visit his son. Only in February 2009, with Smith at his side in Brazil demanding justice from Brazilian judges and government officials, was a visitation order enforced. “Their bond was nearly instant and clearly visible to everyone,” Smith said. I was pleased to hear that the Appellate Court in Rio de Janeiro has upheld the lower court’s decision that Sean Goldman, a young American boy wrongfully retained in Brazil for more than five years, should be reunited with his father David in New Jersey. We appreciate the assistance and cooperation of the Government of Brazil in upholding its obligations under the Hague Convention on International Child Abduction. And it is my hope that this long legal process is now complete and that the Goldman family will be reunited quickly. They will be in my thoughts and prayers today and throughout this holiday season. BREAKING NEWS Brazilian Supreme Court Justice Marco Aurélio de Mello issued a stay order on the return of Sean Goldman until February 2010 when the justice returns from recess. The stay order permits his review a writ of Habeas Corpus filed by Silvana Rebiero, Sean’s maternal grandmother who is not a party to this Hague Treaty case. In his statement to the news media the justice was reported stating that the case should be reviewed in accordance with UN Convention on the Rights of the Child. If that is permitted then the Hague Treaty on the Civil Aspects of Child Abduction is effectively repudiated by the Brazilian judiciary. At this time both David Goldman and U.S. Congressman Christopher Smith remain in Brazil. We also do not know if David will be allowed to visit Sean while he is in the country. David Goldman and his Brazilian attorney Ricardo Zamariola are today filing an immediate appeal with the Brazilian Supreme Court to negate the stay order issued by Justice Marco Aurélio de Mello. It is hoped that the Supreme Court will hear the appeal today, if not the court goes into its Christmas recess, not returning until February 2010. Reacting to the events in Brazil on Thursday, Senator Frank Lautenberg of New Jersey placed on hold a trade bill now in the U.S. Senate that would benefit Brazil and other countries exporting some products duty-free to the United States. David Goldman remains in Brazil with US Congressman Christopher Smith. Events of Friday the 18th have been swift and for us, from such a great distance, difficult to analyze however they appear to be positive for David and Sean Goldman. I: The Brazilian Advocate General (Attorney General) Luiz Inácio Adams, filed a writ of mandamus in the Supreme Court against Supreme Court Justice Marco Aurélio de Mello for granting the stay on the 17th on the writ of Habeas Corpus filed by Silvana Ribeiro (Sean’s maternal grandmother). A writ of mandamus or mandamus (which means “we command” in Latin), or sometimes mandate, is the name of one of the prerogative writs in the common law, and is “issued by a superior court to compel a lower court or a government officer to perform mandatory or purely ministerial duties correctly.”. We are informed that David Goldman’s legal team also filed a writ of mandamus against the justice. In the writ, the Advocate General argues that the entire Supreme Court has already ruled that a writ of habeas corpus is not the appropriate legal instrument to ensure custody of children and asks that the stay order issued by Justice Marco Aurélio be annulled. It is our understanding that since Supreme Court Justice Marco Aurélio de Mello is the target of the writ of mandamus he will be barred from participating in any Supreme Court review. II: United States Senator Frank Lautenberg of New Jersey placed a “hold” on a bill now in the Senate, which grants several countries, including Brazil, the right to import products into the United States without paying import excise taxes. This is a significant move since it directly affects Brazilian business interests as well as those from other countries. Brazil alone received about $2.75 billion in benefits last year. V: In the following video from Rio de Janeiro, David Goldman for the first time, emotionally expresses his reaction and frustration with the stay issued on the 17th by Justice Marco Aurélio de Mello. U.S. Congressman Christopher Smith is at his side. Late Sunday, the Brazilian Supreme Court said in an Internet statement that Chief Justice Gilmar Mendes would rule Monday on appeals made by Goldman and Brazil’s attorney general seeking to lift a stay on the Federal Tribunal’s ruling of the 16th that Sean be handed over to his father. If Mendes lifts the stay, lawyers from both sides said, Sean’s Brazilian relatives could still appeal to the nation’s highest appeals court — but it was questionable whether that court would be willing to review the case if the Supreme Court backs a lower federal court ruling awarding custody to Goldman. Asked if Sean’s Brazilian family would be able to visit the boy, Goldman said yes. “I will not do to them what they’ve done to Sean and me,” he said. The Brazilian family’s lawyer, Sergio Tostes, told the AP he would like to see a negotiated settlement, saying he wanted to end the damage being done to Sean and to U.S.-Brazil relations. “We’re raising the white flag and saying: ‘Let’s get together, let’s talk. We’re the adults, we have responsibilities, so let’s start to have a constructive conversation,'” Tostes said. He also stated his preference to “negotiate” with former Assistant Secretary of State for Latin American Affairs, Bernard Aronson although U.S. Congressman Christopher Smith remains in Rio assisting David and coordinating with the U.S. Embassy and State Department. Goldman, however, was in no mood to negotiate. After many disappointments, Goldman said he was taking nothing for granted. “Until my son and I are on a plane together and those wheels are up, I’ll be no less determined and no less hopeful for that day to come,” he said. United States Senator Frank Lautenberg (NJ) is scheduled to appear on NBC Today Show around 7:00 AM Monday the 21st to discuss the case and the hold he placed on a bill now in the Senate, which grants several countries, including Brazil, the right to import products into the United States without paying import excise taxes. The Bring Sean Home Foundation sent out an email to its 10,000 subscribers and 54,000 Facebook members detailing news and stating “It is vital that justice prevails and Sean is returned to his father, because there are nearly 70 abducted American children being held in Brazil and over 2,800 abducted American children around the world in similar situations. ” The email may be read online here. Please check our Forums for the latest breaking news. 12 Noon EST: No news yet from Rio de Janeiro. David and Congressman Chris Smith were on the Today Show. Smith was at his best, video # 2 below. U.S. Senator Frank Lautenberg was also included but unfortunately he was accorded just a few seconds. 5:30 PM EST: The Brazilian Supreme Court announced that the decision by Chief Justice Gilmar Mendes on quashing the injunction by Justice Marco Aurélio de Mello will NOT be made public until Tuesday 12/22. 3:00 PM EST: We continue to wait for the promised decision by the Brazilian Supreme Court’s Chief Justice which was inexplicably delayed on Monday. Guarded Victory? Our Brazilian legal commentators are of the opinion that this ruling by Chief Justice Gilmar Mendes will not be blocked however we are aware of that additional appeals may be filed by Sergio Tostes, the attorney representing Sean’s maternal grandmother, Silvana Rebiero. David’s U.S. attorney, Patricia Apy was quoted by the AP as saying, David’s Brazilian attorneys had not heard from lawyers for the Brazilian family. Congressman Christopher Smith (NJ) remains in Rio de Janeiro with David Goldman and speaking with reporters on Tuesday evening referred to David’s reaction, “He was elated, a big smile came to his face, but he said ‘I’m not going to let my guard down until it’s wheels up,'” Smith also added that law enforcement was on guard in case the Brazilian family did not transfer Sean. He said the international police agency Interpol had been notified to make sure Sean was not flown out of Brazil. “Our hope is, given the prominence of this family in legal circles, that’s less likely to happen,” Smith said. U.S. Senator Frank Lautenberg (NJ) who reacted to the case last Friday by blocking renewal of a trade bill that benefits more than 130 countries, including Brazil, by allowing them to export a variety of products duty-free to the United States lifted the “hold” after Tuesday’s ruling in Brazil and the U.S. Senate quickly passed the trade measure. Brazil is the fifth largest beneficiary from the duty-free provision, receiving an estimated $2.75 billion in benefits last year, according to Lautenberg’s office” (Source: AP). No real need for an update this morning, the news is all over the country. David and Sean have been reunited and are on their way back to the United States. David Goldman, throughout this ordeal, has shown the world a man whose dignity, grace, love and fortitude can only be admired. Sean will soon realize that he was blessed to be born the son of such a man. We wish we could personally thank the tens of thousands of people from around the world who helped make this happen. Without the efforts of every single supporter the reunion today would not have happened. We hope you have a joyous Christmas and 2010 will be a wonderful new year of happiness, health and prosperity for you and our country. Our work together at the Bring Sean Home Foundation is not over, we have just begun.